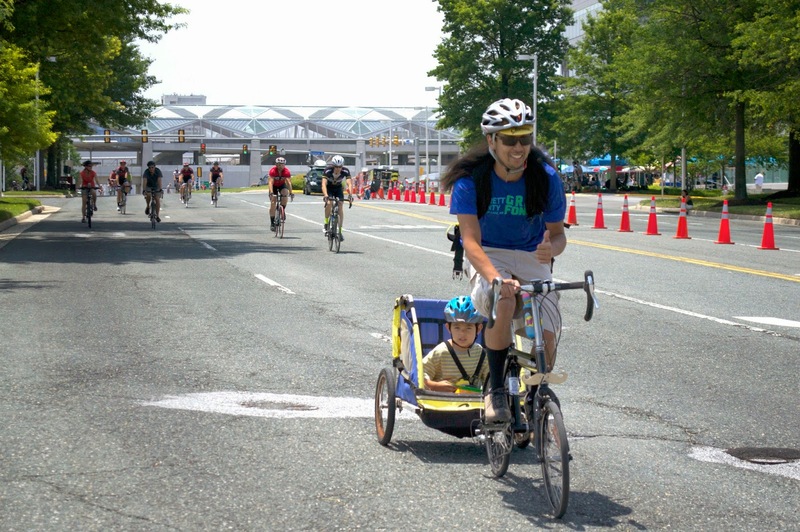 Today bike riders took over a few streets in Tysons during the Tour de Tysons races and Family Fun Ride. The weather was ideal (except for the wind that tried to blow our tent away). FABB volunteers gathered nearly 90 signatures on our petition to urge the Fairfax County Board of Supervisors to adopt the Bicycle Master Plan. Thanks to all our volunteers and to everyone who took the time to stop by and sign the petition. We plan to have an online version of the petition soon. Convoys from Vienna and The Barns at Wolf Trap arrived as the event got underway. Liz MacGregor held a well-received talk entitled Getting There By Bike! About 30 riders participated in the Family Fun Ride. Actually there were many more riders than that. We didn't expect to see so many of the racers warming up during the Fun Ride. I guess they wanted to have fun as well, but why were they riding so fast? Thanks to Bill Luecke of National Capital Velo Club and Kate Maholchic of Tysons Partnership for inviting FABB and providing all the logistical support. 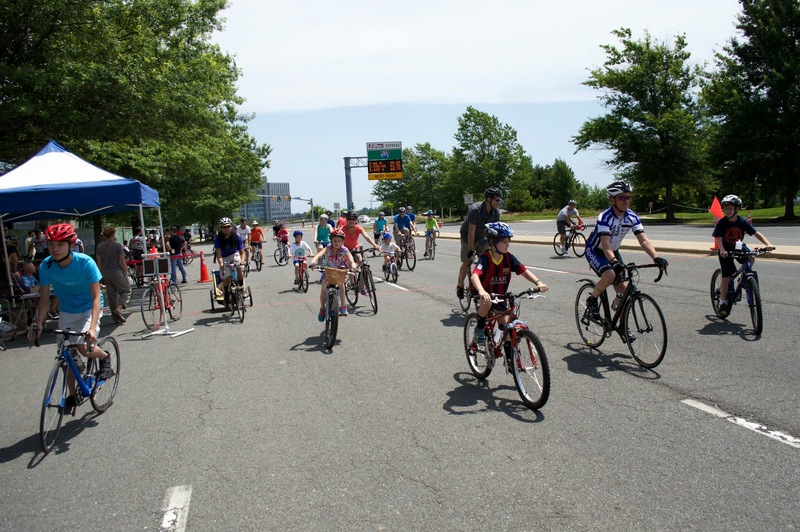 We hope that events like the Fun Ride will lead to more open streets type events in the future, with the goal of a full-fledged ciclovia held in Fairfax County in the coming years. Who is that fast rider next to me! RICHMOND – Virginia’s roads should be safer for bicyclists across Virginia beginning July 1. That’s when a new law requiring motorists to pass bicyclists by three feet goes into effect. 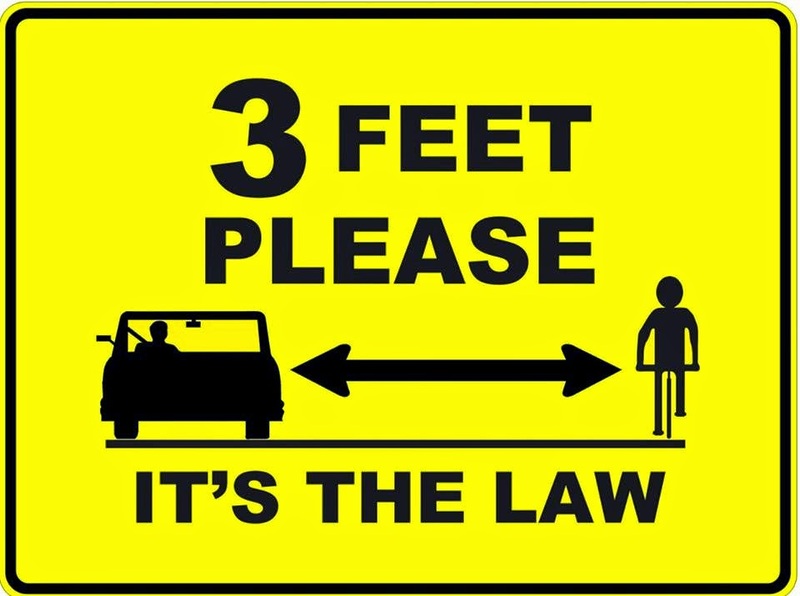 Virginia law currently requires a motorist to pass a bicyclist by two feet. The Commonwealth is the twenty-first state to pass a three foot law. Pennsylvania requires four feet. According to statistics from the Virginia Department of Motor Vehicles (DMV) Highway Safety Office, in 2013, eight people died and more than 600 people were injured in crashes involving bicycles on Virginia roadways. The legislation was sponsored by Senator Bryce Reeves, R- Spotsylvania. "Our ability to be able to work across the aisle and build relationships in a bipartisan manner allowed us to successfully get this commonsense legislation approved. Those that are active in the bicycling community—as well as my Republican and Democrat friends in both the House of Delegates and the Senate—were all part of making this legislation possible. I will continue to work very hard on areas where we can find common ground and consensus for the people of Virginia." The VBF is working with other organizations like DriveSmart Virginia and state agencies such as DMV, VDOT and the Virginia State Police to educate drivers about the new law. Drive Smart Virginia is selling bumper stickers of the image above. Reston Bikeshare Feasibility Study: On Wednesday Fairfax County held two bike-related meetings in Reston. The final results of the bike share feasibility study were released during the first part of the meeting. The consultant, Alta Planning + Design, concluded that bike sharing is feasible in Reston. Phase 1 would consist of 13 stations with 130 bikes, all but one station located north of the Toll Road, with most in the Town Center area. 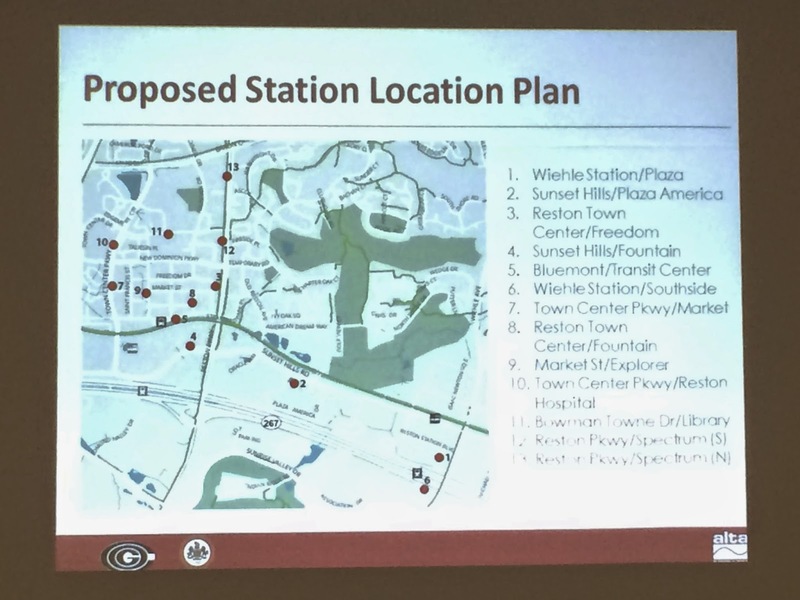 The station locations were determined based primarily on potential demand and the desire to reduce the space between stations. Two stations would be located at the Wiehle-Reston East station, one on each side of the Toll Road. Most of the other stations would be clustered around the Reston Town Center. With an almost direct connection via the W&OD Trail between the Wiehle station and the Town Center, bike sharing is an ideal personal mobility option. 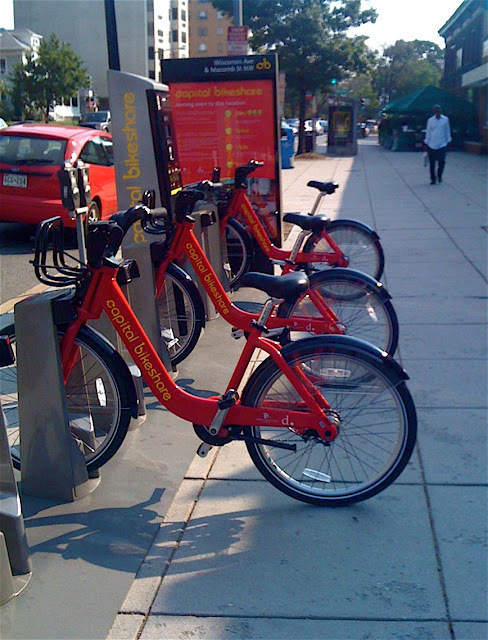 The logical vendor is Capital Bikeshare which operates systems in Arlington, Alexandria, DC, and Montgomery County. Fairfax could leverage existing infrastructure and contracts to create a suburban extension of that system. Even though a Reston operation is physically separated from other operations, there would not be a need for a new warehouse. A truck would be dedicated to rebalancing bikes; when a station is empty, filling in with bikes from a station with too many bikes. The cost of Phase 1 is estimated to be $1.2 million, of which $54K is for Launch (startup costs), $766K for Capital (cost of stations, docks, bikes), and $397K for Operating costs. Not sure if this is for launch plus one year of operations or if the operating costs are for multiple years. I think it's for one year. Phase 2 would include stations in the Lake Anne and South Lakes areas. Challenges include the need for route way finding signage, snow removal in winter, access and proximity for low income users, funding for capital and operations, and putting stations on private property. The system could be implemented within the next couple of years. 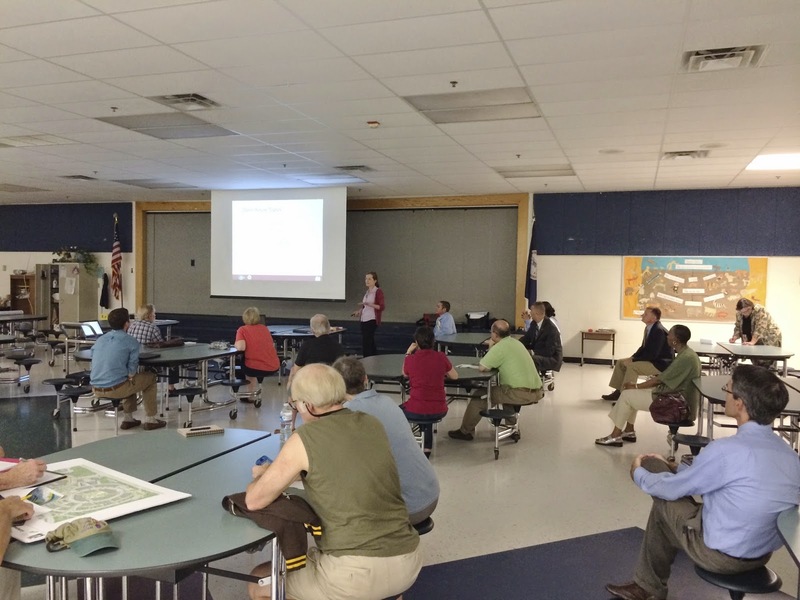 One concern raised during the meeting was the lack of bike facilities on Reston roads. While Reston has an extensive trail network, direct routes to destinations are usually located on roads. The response was that implementation of the Bicycle Master Plan would help create a more bike-friendly environment. It was also noted that extensive pedestrian and bike projects are included in the proposed 2014 Transportation Bond referendum, although none of the projects in the Bond would improve conditions for traveling between the proposed stations. Adam Lind of FCDOT is the project manager. Fionnuala Quinn and Charlie Denney presented for Alta. Supervisor Hudgins and Tom Biesiadny, head of Fairfax DOT, were present. Approximately 25-30 people attended. The final report is not yet completed. The delivery date is June 30 and sometime after that the report will be on the county website. There were no handouts and no information is yet available on the county website. 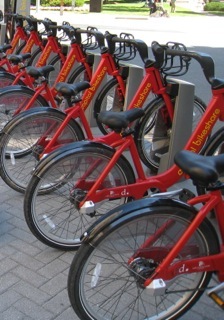 See an earlier Reston Patch article on our views on bikesharing in Reston. Most of the station locations we suggested were deemed too spread out to be feasible in Phase 1. Bicycle Master Plan - Charlie Strunk presented an overview of the plan similar to his presentation to the Board on May 6 and a longer presentation on September 17, 2013. Bob Patten of Toole Design Group, the plan consultant, was also present. The Planning Commission public hearing is scheduled for Oct. 1 and the Board of Supervisors hearing is on October 28. Paper copies of the bike facilities maps were available but there were no copies of the plan text or any handouts. Copies of the maps and plan text will be posted on the county website any day now. There was extensive discussion of how to make Wiehle Ave, from the new Wiehle-Reston East station north, more bike-friendly. With narrow lanes, a narrow trail, and steep terrain adjacent to the trail, options are limited. When asked if the plan contains a prioritized list of future projects the answer was no. The plan provides overall guidance. The county recently completed a prioritization projects, the Countywide Dialogue on Transportation, to create a six year plan. That plan is updated annually and we think once the plan is adopted the next step for bicyclists is creation of a robust prioritized list of bike projects. A good start would be filling in the gaps on the Bicycle Route Map; converting the Less Preferred routes into Preferred routes and ensuring bike access to activity and transit centers. FABB is encouraging bicyclists to support the Bicycle Master Plan and attend the public hearings to show that support. We are planning rides to the hearings. Fairfax County DOT is hosting two bike-related meetings tonight in Reston. 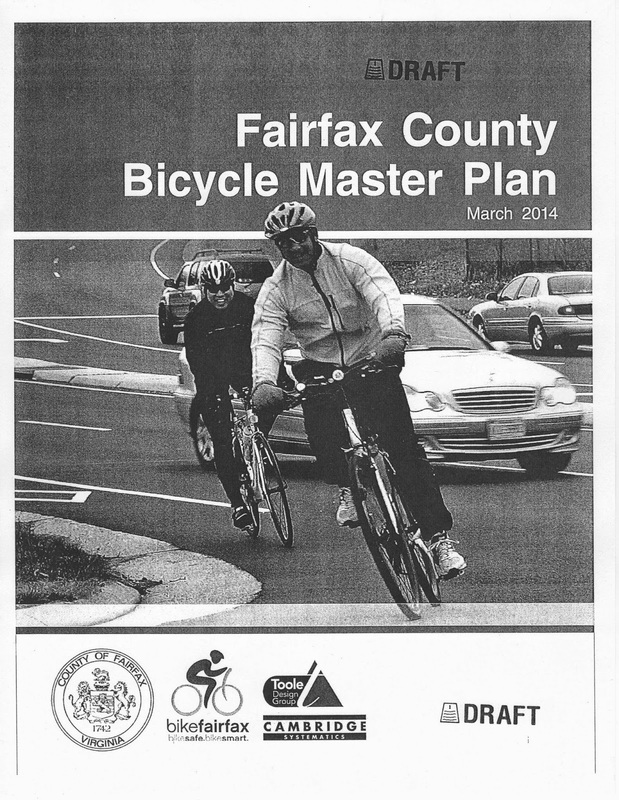 Bicycle Master Plan Final Draft: Immediately after the bikesharing meeting the county will present the final draft of the Fairfax County Bicycle Master Plan from 7:30-9:00 p.m. The plan has been under development for the past five years. Unfortunately the plan is not yet posted on the county website. We've been told the latest draft will be posted any day now on the Countywide Bicycle Master Plan page. The Tysons Bicycle Master Plan is posted but that plan has been merged with the countywide plan that will be released tonight. FABB has been urging the county to publish the draft plan and we hope it will be available soon. Dogwood Elementary School is located not far from the Fairfax County Parkway Trail, the W&OD Trail, and the surrounding streets are very bike-friendly. Bike parking is located in the rear of the building. The racks are an unusual design that we've not seen before. 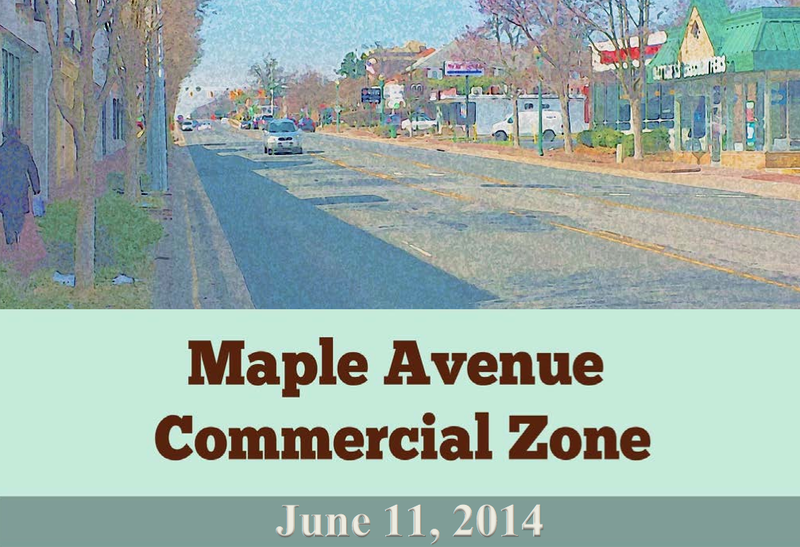 Town of Vienna Maple Ave Corridor zoning regulations: On a related note, the Town of Vienna Planning Commission is meeting tonight to consider forwarding the draft Maple Avenue Corridor zoning regulations to the Town Council. FABB and other cyclists have asked for sufficient bike parking regulations, similar to those in Tysons and Arlington. That meeting begins at 8pm at Town Hall. Where: From Tuckaway Drive to Franklin Farm Road. VDOT is finalizing the stripping of bike lanes on Courthouse Road between Route 123 near Oakton to just west of Nutley Road in Vienna. A combination of bike lanes and shared lane markings (sharrows) are part of a repaving project on that section of Courthouse Rd. 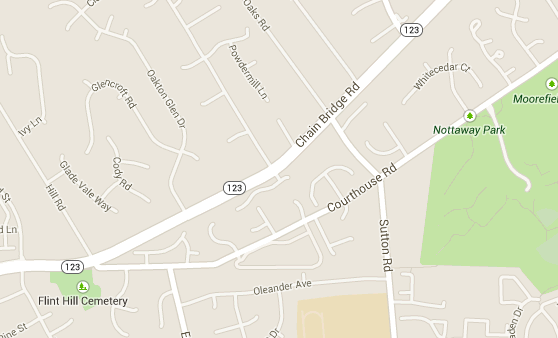 Courthouser Road is currently used by many cyclists as a way to avoid riding on bike-unfriendly Route 123. The new bike lanes should encourage others who live in that area to take more short trips by bicycle. Immediately to the east of this project, the Town of Vienna has designated Courthouse Road as a bike route using signage. Courthouse is used for accessing Nottoway Park, the Vienna Metro station to the south, the W&OD trail, and other destinations in the Town of Vienna. What is needed next is a better connection to the Oakton area and Germantown Road to the west. 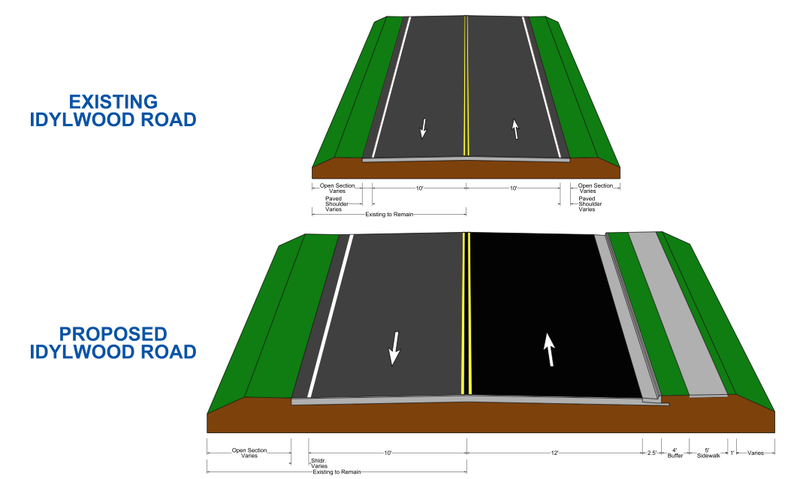 Update July 1, 2014: VDOT is finalizing the striping of Courthouse Road with bike lane symbols. Saturday, July 26 was recently announced as the opening day for Silver Line service. 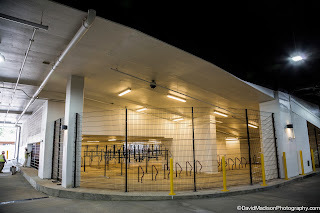 To celebrate the concurrent opening of the Wiehle-Reston East Metrorail station bike room, Fairfax County will be holding an open house and ribbon-cutting for the room on Saturday, July 19. We've heard that bike trains will be converging on the station around 9:30 a.m. followed by a bike parade. A formal program is scheduled for 10 a.m. followed by the ribbon-cutting. Bike organizations and bike shops will have information tables. As we learn more about the event, including a link to additional details, we'll post it on the FABB site. Additional details about the open house: The ribbon-cutting ceremony will start at 10 a.m., and the Open House and Transportation Expo will follow the ceremony and run through 3:00 p.m.
Several organizations, including FABB, plan to have booths at the event. Folks from the Reston Master Plan Special Study Phase 2 will be there to discuss and answer questions about the study. On our ride home today we happened across a bike crash on South Lakes Dr at Springwood Dr, just west of Soapstone Dr in Reston. A cyclist was headed east on South Lakes Dr at around 5:30pm when a motorist who was headed west turned left in front of the cyclist. By the time we arrived the cyclist had already been taken to the hospital. The motorist stated that she turned left into the path of the oncoming cyclist. She said she didn't see the cyclist who ran into her car. The sun angle did not appear to be a factor. Police officer S.A. Mohr took statements from bystanders and the motorist. We asked if the motorist would be ticketed and Officer Mohr said that the motorist admitted hitting the cyclist and that she would receive a citation. Above is a photo of the cyclist's bike, with the handlebars askew. There was broken glass on the road where the crash occurred. We don't know the name of the cyclist or their condition. We assume he (bystanders said it was a male rider) was among a number of cyclists warming up for the 6pm Reston Bike Club Tuesday ride at Hunters Wood Shopping Center. Cyclists will often ride a loop from Hunters Woods along Colts Neck Rd to South Lakes Dr to Soapstone Dr to Glade Dr back to Hunters Woods. 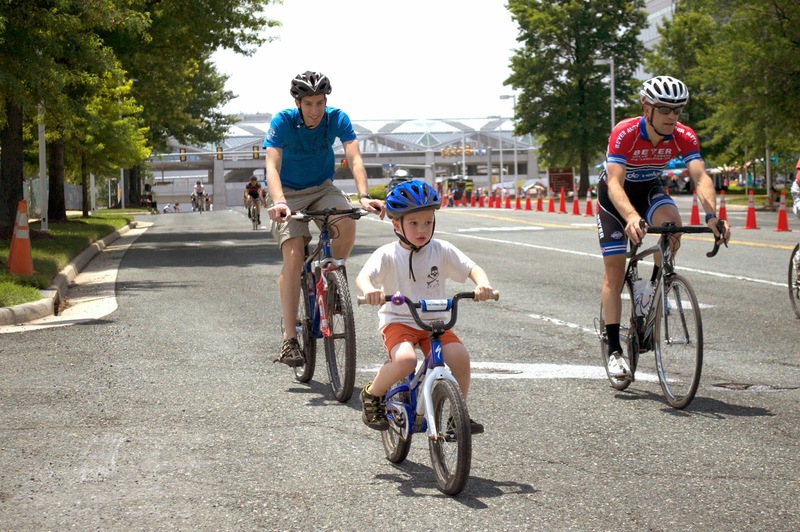 Watch the Tour de Tysons races on Sunday June 29 and bring the family! 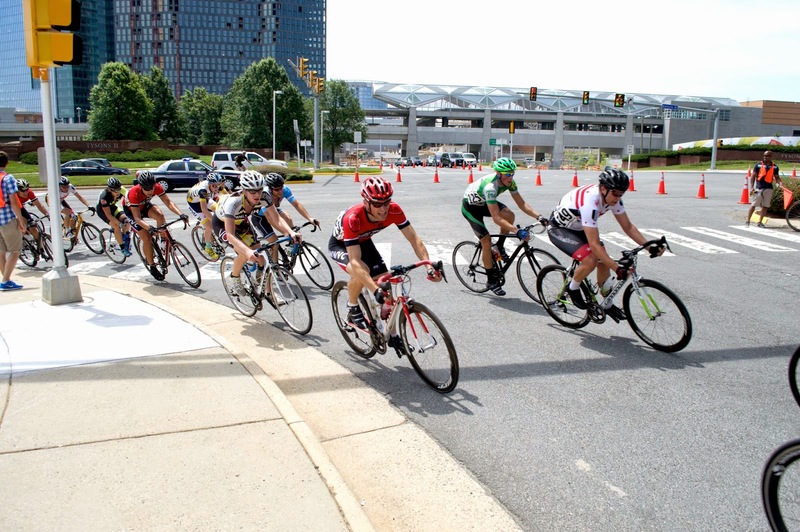 Tour de Tysons is more than just racing this year. 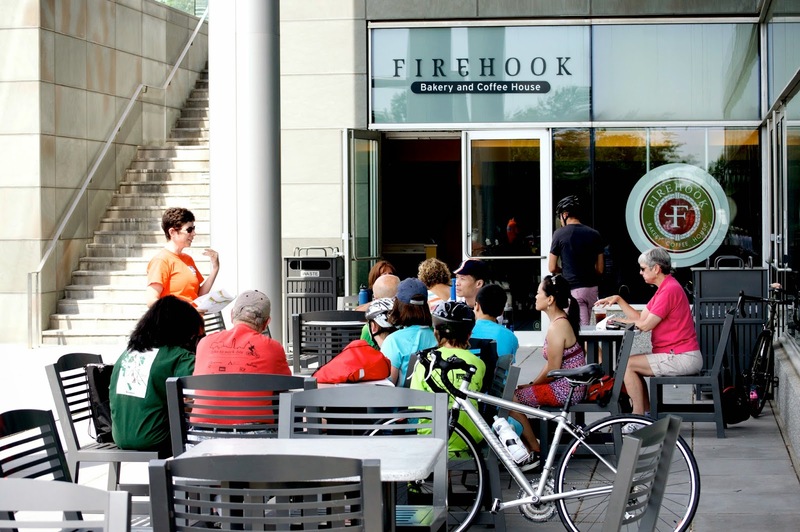 Stay for the day and connect with people who are passionate about bicycling in Tysons and beyond. Come join FABB for food and fun in the newest downtown in Fairfax County. 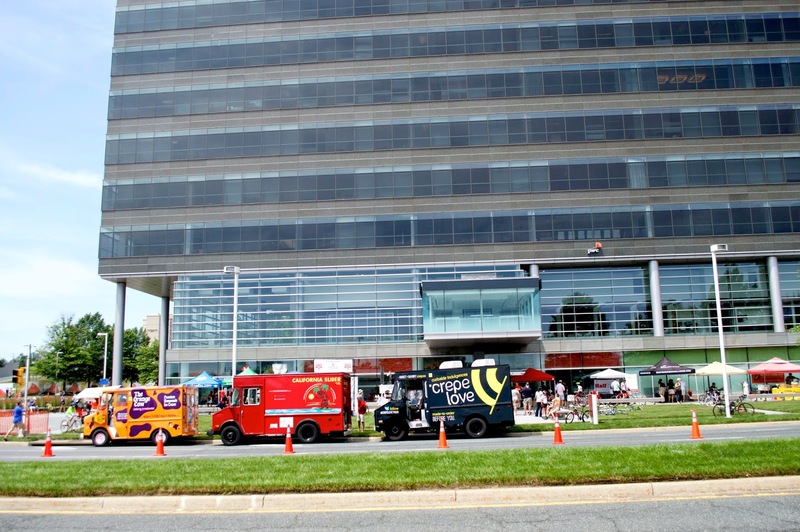 FABB has partnered with Tysons Partnership and the Tour de Tysons sponsors to bring you events throughout the day. 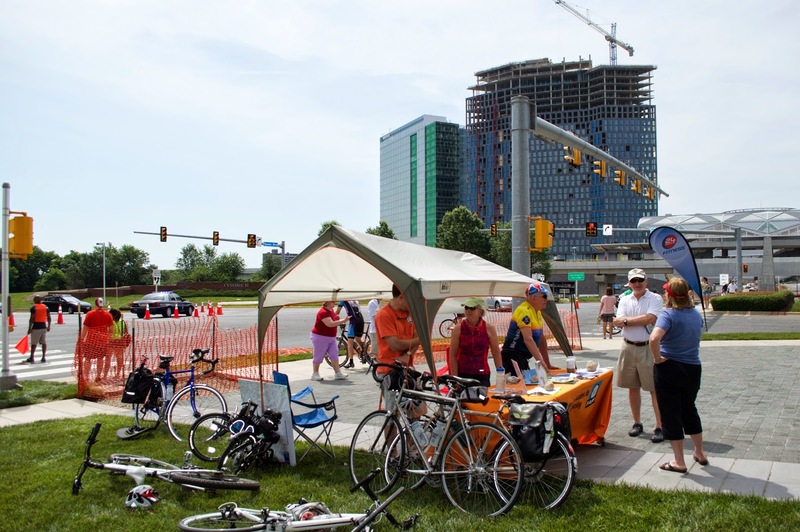 A long term goal of FABB is the transformation of Tysons into a bike-friendly community. FABB was involved in the planning for the future of Tysons that resulted in major Comprehensive Plan Changes in Tysons. Those changes include bike lanes on several Tysons roads, new trail links into Tysons, improved on-road conditions in and around Tysons, new bike parking requirements, and improved signage. Those changes are still a few years away, but this is a chance to learn about changes coming to Tysons and to discover bike routes to several of the new Tysons Silver Line stations. 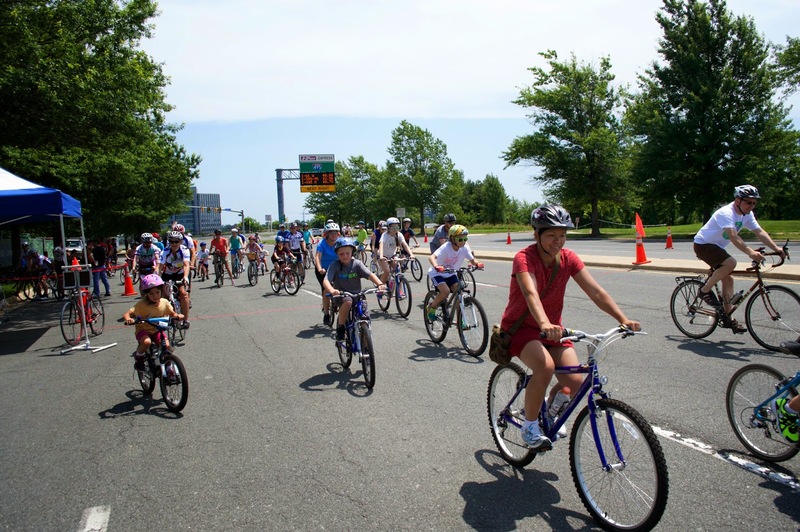 Tysons Open Streets Family Fun Ride - Experience Tysons in a new way as you pedal along the TdT course at your own pace. Talk - Getting there by Bike! - Elizabeth MacGregor, Certified Bike Instructor and FABB Board Member, will talk about how to make the most of your bike. You'll learn that getting around by bike is easy, fun and saves you money. Learn about the feasibility of bikesharing in Reston at a community meeting on Wed. June 25 from 6:30-7:30 p.m. at Dogwood Elementary School. Fairfax County recently contracted with Alta Planning + Design to determine if bikesharing is feasible in Reston. The consultants have completed their report and they are going to share the results with the community. Questions like cost, bikeshare station locations, and other implementation questions will be answered. Immediately after the bikesharing meeting the county will present the final draft of the Fairfax County Bicycle Master Plan from 7:30-9:00 p.m. Unfortunately the plan is not yet posted on the county website. We've been told it will be posted any day now. Dogwood Elementary School is located not far from the Fairfax County Parkway Trail, the W&OD Trail, and surrounding streets are very bike-friendly. Bike parking is located in the rear of the building. 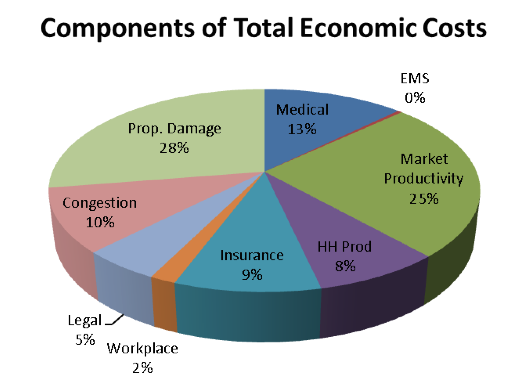 The National Highway Traffic Safety Administration (NHTSA) recently released a report on the cost of motor vehicle crashes, New NHTSA Study Shows Motor Vehicle Crashes Have $871 Billion Economic and Societal Impact on U.S. Citizens. The U.S. Department of Transportation's National Highway Traffic Safety Administration (NHTSA) today released a new study that underscores the high economic toll and societal impact of motor vehicle crashes in the United States. The price tag for crashes comes at a heavy burden for Americans at $871 billion in economic loss and societal harm. This includes $277 billion in economic costs – nearly $900 for each person living in the United States based on calendar year 2010 data — and $594 billion in harm from the loss of life and the pain and decreased quality of life due to injuries. If you want to talk about funding ped and bike projects based on their mode share, we should be spending at least 7% of our transportation funding on creating safe conditions for bicyclists and pedestrians. See the full report. Yesterday WTOP reported on this weeks Board of Supervisors meeting at which they voted on the list of projects to be included in the 2014 Transportation Bond. See our blog post about the bond projects. WTOP seems to be stoking the so-called 'War on Cars" with their inflammatory headline Fairfax County supervisors raise concern about 'war on cars.' The headline should have read "Supervisor Herrity continues his war on bikes." Supervisor Herrity thinks Fairfax County is spending too much money on bike and pedestrian facilities. Funny, I haven't really noticed much impact of all this funding on bikes. Bike lanes that I use on Soapstone Dr. and Lawyers Rd. cost almost nothing because they were created as part of repaving and restriping projects. Fairfax County is proposing to fund $6 million in bike projects as part of the bond and $77.6 million in pedestrian projects. The county plans to spend $1.4 billion on all transportation projects over the next six years, most of which are being funded by new state monies. The county has decided that bike and ped projects don't qualify for these new funds so they are included in the bond project. The $6 million for bike projects is 0.46% of $1.4 billion. And yet Supervisor Herrity thinks that's too much. Knowing full well that most of the county funding is going toward expanding roads, building large interchanges, and building parking garages at Metro stations he states the following: "The scope and extent of the $85 million in bike and pedestrian projects included in this referendum far exceed both the current and projected mode share, especially given that we've got so many unfunded projects that would relieve significant congestion." For the second time in the past month he goes on to mischaracterize the amount of space devoted to bikes and peds on the proposed Soapstone Connector bridge in Reston: "You take the proposed Soapstone Connector: 35 feet of that, or 60 percent of it is now proposed for bike and pedestrian yet it shows as a highway expansion," The proposed Soapstone Connector bridge, located near the new Wiehle-Reston East Metrorail station, is 99.5 feet wide. Significant bike and ped traffic is expected in the near future. There are four 12-foot lanes for motor vehicles. Bike lanes comprise 10 feet or 10% of the total width. The 10 foot trail comprises 10%. The 5 foot sidewalk is 5 %. The total devoted to bikes and peds is 10 + 10 + 5 or 25%. Fairfax County is spending nearly a $BILLION on projects used by motorists. They are also trying to rectify some of the errors of the past when roads were built without any bike or ped facilities, and yet Supervisor Herrity thinks we're not spending enough to support motorists. Fortunately the majority of the Board disagrees with Herrity and they voted to include the proposed ped and bike projects in the bond. Despite the small amount of funding for bike projects, we strongly support the bond referendum and urge you to support it as well. You may recall that more than once Supervisor Herrity has tried to eliminate the bike coordinator position and he continues to argue against additional funding for bike facilities. Feel free to contact Supervisor Herrity to let him know what you think. FABB's monthly meeting is tonight at 7:30pm at Patrick Henry Library. We'll be discussing preparations for FABB events at the Tour de Tysons, our comments on the I-495 ped/bike projects on Chain Bridge and Idylwood Roads, and other FABB business. Also tonight is the second round of public workshops on the Herndon Metrorail Station Access Study. Please join the Fairfax County Department of Transportation for a public workshop on June 18th to discuss planned bike and pedestrian facility improvements designed to provide access to and from the future Silver Line Metrorail Stations. Survey results from our public outreach efforts will be presented. Join members of your community to share your thoughts on walking and bicycling access to the future stations. Follow the project online at www.hmsams.com. Where: From Rugby Road to Tuckaway Drive. We're encouraged that the bike projects are now broken out and not lumped together with the $77.6 million in pedestrian projects. We're disappointed that more bike projects aren't included in the bond given the need. None of the bigger ticket items that are on a larger list of $200 million in bike/ped projects are on the list such as the Mt Vernon Memorial Hwy trail improvements, Old Keene Mill Road bike shoulders, Route 236 Corridor bike improvements, and Scotts Run Stream Valley Trail. Update 17 June 2014: VDOT implements new safety measures on Berkley Bridge. See update info below. Kelley Howell of Norfolk was riding her bike across the Elizabeth River on the Berkley Bridge when a vehicle approached her going about 15mph. The vehicle struck her as it passed. She captured it all on video. Though she and the driver exchanged information, Howell told WVEC later when she reported the issue to the authorities, she was told they wouldn’t be investigating the incident. “I said, ‘I have video if you want to see,’ and he said, ‘Oh, why do you have video?’ And I explained that I use it to educate, and he said, ‘Oh maybe you were the person who caused the accident,’” Howell told the news station of her interaction later that day with a Norfolk Police Department officer. Howell said the officer could not investigate the case because he was not called to the scene at the time. Howell told the Virginian-Pilot that neither she nor the driver had a cellphone at the time to report the incident to the police. The Virginia Department of Transportation (VDOT) is investigating the traffic incident that occurred on the Berkley Bridge pedestrian access pathway, Saturday, June 14, involving a motorist and a bicyclist. 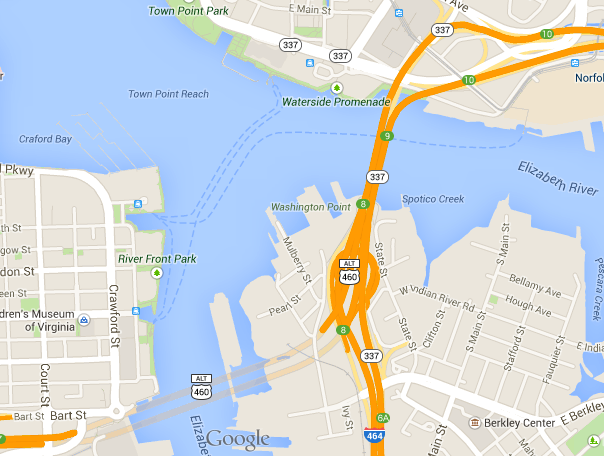 The accident occurred when a bridge tender was en route for a shift change. The pathway is used by employees for this purpose and signs are posted in both directions advising caution and to be aware of vehicles using the pathway. VDOT is working with its contractor to determine the factors involved in the incident and to ensure that proper policy and procedures were followed. The driver of the vehicle has been placed on administrative leave. Based on the outcome of the investigation, necessary steps will be implemented to enhance safe and secure pedestrian and bicyclist access at the Berkley Bridge. Motor vehicles travel on the W&OD Trail on a regular basis. When cyclists approach they almost always stop and pull over. They travel at a very slow pace, usually less than bicycle speed. It's inexcusable that the motorist on the Berkely Bridge was traveling so fast, and that he didn't stop when the cyclist approached. VDOT needs to immediately implement new policies to protect users of this trail. In the video you'll see three kids traveling in the opposite direction. Imagine what would have happened had the motorist approached them at speed and expected them to get out of the way. NORFOLK– Effective today, the Virginia Department of Transportation (VDOT) has implemented immediate measures to enhance safety for public use of the Berkley Bridge pedestrian access pathway. VDOT conducted a review following an incident this past weekend on the pedestrian access pathway involving a bicyclist. Based on the review, VDOT has modified procedures for access to the bridge, which restrict bridge tenders from utilizing vehicles for shift changes. Bridge tenders must now walk or utilize a motorized cart. When a vehicle is required, it will be accompanied by a walking spotter to identify any potential safety issues. In addition to the improved safety procedures, VDOT has scheduled the installation of traffic control devices to deter motor vehicles from entering the pathway. The devices will not interfere with pedestrian and bicyclist access. VDOT will continue to evaluate further safety measures that may include additional signage and other traffic control devices and/or markings to provide optimum safety for the public. ALERT: this afternoon the greater metro D.C. region is reaching an unhealthy air quality level – marking today as the first Code Orange day of the season. Clean Air Partners’ air quality experts are available to speak to the region’s air quality, provide tips for sensitive groups (i.e. children, older adults, individuals with heart and/or respiratory conditions, and those who are active outdoors). We would like to encourage bikers to sign up for the free AirAlerts at Clean Air Partners. • Limit driving; carpool or take public transit. • Refuel your car in the evening. • Put off lawn care until air quality improves. • Use a gas or electric grill instead of charcoal. Although air quality may be unhealthy year-round, it is typically more of concern during “ozone season” (May through September) when ground-level ozone and particle pollution are at their highest. During a forecasted Code Orange or Red day, sensitive groups should limit prolonged outdoor exertion. Sensitive groups include individuals with heart and/or respiratory disease (asthma, bronchitis, emphysema, or cardiovascular disease), children, older adults (65+), and those who are active outdoors. On Code Red days, the general public should limit prolonged outdoor exertion as well. 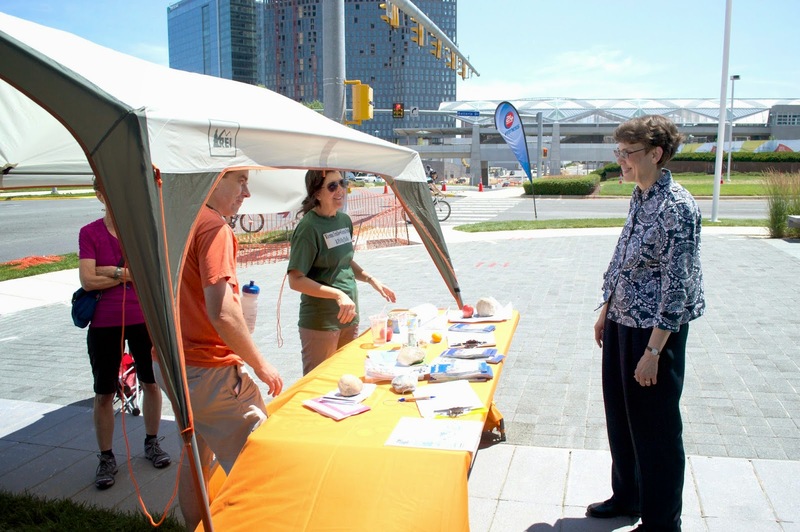 Clean Air Partners is dedicated to empowering the metropolitan Baltimore-Washington region with the tools to make meaningful improvements in our region’s air quality and the reduction of greenhouse gas emissions. Actions we can all take in our daily lives and continued over the long-term will make a big difference. Update - Monday, June 16: Today NVRPA released the final report of the trail safety meeting, Improving W&OD Trail Safety: A Stakeholder Workshop. Back in April Northern Virginia Regional Park Authority (NVRPA) conducted a trail safety meeting. Representatives from various governments and citizen groups attended the day long meeting to discuss ways to make the trail safer. The focus of the meeting was safety at intersections, especially in light of a new law that was passed in Richmond "that will allow local governments to enact ordinances related to the stop signs on the trail." NVRPA just received a copy of the final report that will be posted on their website next week. Below are my notes from the meeting. NVRPA wants to ensure a uniform approach to intersection treatments. They don't want to see a piecemeal approach by jurisdiction. There are 70 trail intersections and cyclists generally do not know in which jurisdiction they are riding. 1,695 responses were received. Over 300 responses were from Arlington. Around 150 respondents were from these locations: Vienna, Reston, and Falls Church. 58% were male, 42% female. 51% of respondents used the trail weekly, 20% monthly, and 18% daily. The most often used segments were (in order of highest use): Falls Church to Reston, Shirlington to Falls Church, Reston to Sterling, Sterling to Leesburg, and Leesburg to Purcellville. One of the more interesting questions was whether users came to a full stop at intersection crossings, almost all of which have a STOP sign for trail users. 18% said they always stop, 36% said they almost always stop, 30% said they often stop, and the truthful ones, 16%, said they rarely stop. I would guess that 84% of trail users do not often stop at STOP signs. In my experience it's rare that someone will come to a complete, foot down stop. Over half said they observed a conflict on the trail. Conflicts between bikes and pedestrians, bike and cars, and bikes and bikes were most commonly observed. Users were split on whether a speed limit should be imposed on the trail. The most common strategies cited for improving trail safety were Better education, More safety signage, Physical improvements, and More enforcement. 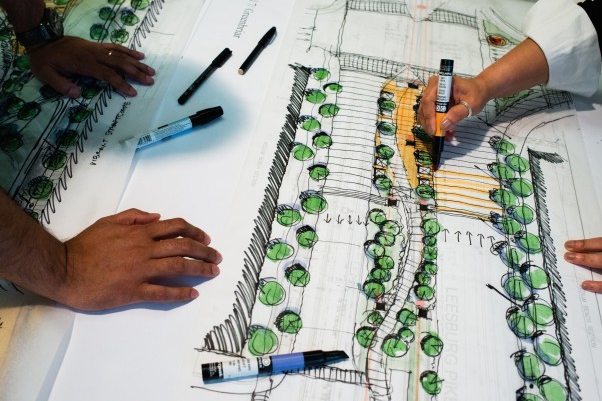 Improve design at intersections so that the trail is more prominent as it crosses the street. Make vehicle crossings (for drivers on the road) more visible through tactics such as “stop ahead” painted on the pavement, rumble strips before intersections, zig-zag marks before intersections, raised crosswalks, and increasing the width of crosswalk markings. Install Rectangular Rapid Flashing Beacons (RRFB) at problem intersections. An RRFB is comprised of two lights that alternate rapid flashing when trail users press a button. Use asphalt treatments such as a colored transition in areas where trail users should slow down or exercise caution (for example in congested areas or near a school). Improve the surrounding bike infrastructure so that the W&OD trail is not the only option for bike commuters. On Wednesday, June 25 Fairfax County will present the final draft of the Fairfax County Bicycle Master Plan at a meeting in Reston. The meeting is from 7:30-9:00 p.m. at Dogwood Elementary School. Bike racks are located in the back of the building. Two other meetings are planned in the south and central parts of the county. The Plan has been under development for the past four years. The first draft was completed in April 2011 and covered the Greater Tysons area. The first draft of the countywide plan was completed in July 2012. County staff have been preparing final language since that time. While the final draft is not available yet on the county Bike Program website, we hope it will be there soon. On Wednesday, July 23 the Planning Commission will hold a working session on the Plan starting at 7:00 p.m. at the Fairfax County Government Center. A public hearing before the Planning Commission is scheduled for Wednesday, September 24. The Board of Supervisors public hearing on the Plan is scheduled for Tuesday, October 28. The September and October dates "are tentative and can be modified should substantial comments arise requiring additional staff time to address." Check the FABB Events page for the latest info. The Town of Vienna is holding a public hearing on the Maple Avenue Vision on Wed., June 11 starting at 8 p.m. in the Council Chambers at 123 Center St. S. Included in the Vision are recommendations for bike parking requirements. In Tysons, Fairfax County requires 1 bike parking space for every 5 residential units. Alexandria requires 3 bike parking spaces for every 10 residential units. The current Vienna proposal for bike parking in the Vision document is minimal. Only multifamily residential developments of 30 units or more are required to provide bike parking at a rate of 1 bike parking space for every 30 units. The W&OD Trail is one of the most popular bike trails in the country, and many future Vienna residents will own bikes, not only to ride the trail but to use for short trips around town. We think that one space for every 30 units (with each unit likely holding more than one person) is insufficient. We also think that all multifamily developments should provide secure, covered bike parking that meets accepted standards. Cyclists are encouraged to attend the public hearing and speak out for the inclusion of safe, convenient bike facilities in the Maple Avenue Vision that includes sufficient bike parking requirements for future developments. If you cannot attend the meeting you can contact the Planning Commission. 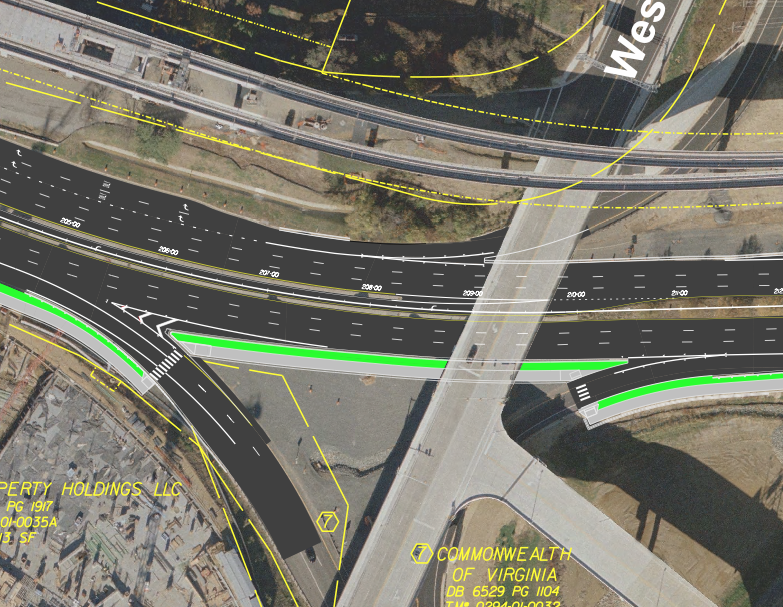 As part of the 495 Express Lane Project VDOT is building new connections across I-495 for bicyclists and pedestrians. VDOT is holding a design public hearing to give an overview of the planned facilities and to receive comments from residents. The meeting will be held on Wednesday, June 11 from 6:30-8:30 p.m. at Fairhill Elementary School, 3001 Chichester Lane, Fairfax, VA 22031. There will be a presentation at 7:00 p.m.
Cyclists are encouraged to attend to learn about the project and provide comments. If you plan to ride, plan your route well. The meeting location is not bike-friendly, requiring cyclists coming from the W&OD Trail to travel on Cedar Lane, a narrow, busy commuter route. This project will complete pedestrian and bicycle facility connections along Idylwood Road (Route 695) and Chain Bridge Road (Route 123), providing enhanced and safer pedestrian and bicycle access at I-495 in Fairfax County. On Idylwood Road, the project includes a standard five-foot wide sidewalk to be constructed on the south side of the Idylwood Bridge across I-495, connecting with the sidewalk on the bridge. 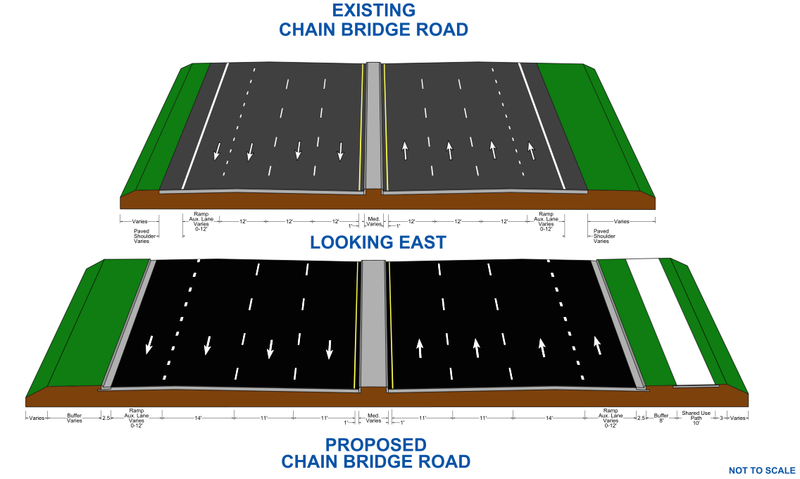 On Chain Bridge Road, a standard 10-foot wide shared-use path will be constructed on the south side of I-495 between Tysons Boulevard and Old Meadow Road. While we are encouraged that work is being proposed to overcome longstanding barriers for cyclists, we think the plans need to be improved. The project will cost $6,000,000. The 10-foot shared-use trail on the south side of Chain Bridge Road/Route 123 will cross four high speed entrance/exit ramps at grade. In several locations bicyclists would be facing forward with traffic approaching from the rear. In our opinion the crossings will be dangerous. A better option would be to separate the trail from the road by having trail users pass over the ramps similar to crossings on the Custis Trail in Arlington and those planned on Route 7 in Tysons. Route 123 will be widened to have 14 foot outside lanes to the left of a ramp merge lane. Will cyclists feel safe riding in this wider lane with high speed traffic adjacent to a high speed merge lane? I think only the most experienced cyclists would use the lane to navigate through the interchange. Why not use the money required to widen Route 123 and create safer crossings for the shared-use trail by bridging the ramps? What do you think? On Idylwood the "bicycle" improvement is a 5-foot wide sidewalk. The eastbound lane will be widened to 12 feet which is still not wide enough for a bicyclist and motor vehicle to share safely. A 10-foot shared use path is needed instead of this narrow sidewalk. In our opinion, keeping the lane narrow and using those funds to widen the trail would be a better investment. Comments are being accepted until June 26. Send them to meeting_comments@vdot.virginia.gov with the subject "I-495 Bicycle-Pedestrian Trail Improvements." On May 21, the TPB approved 13 projects in Northern Virginia for funding under the Transportation Alternatives Program for FY 2015. The Transportation Alternatives program provides funding to projects considered "alternatives" to traditional highway construction and that expand travel choices, and enhance the transportation experience by integrating modes and improving the cultural, historical, and environmental aspects of the Washington region’s transportation infrastructure. TICKETS: $45 for WABA members; $55 for the public. Can you imagine what it would be like without the Capital Crescent Trail, Beach Drive closed to cars on weekends or bike access on Metrorail and bus? Can you imagine how the region might have developed without an organization dedicated to making sure that bicycling is part of the transportation solution? BikeFest is our annual fundraiser and celebration of bicycling. It’s our chance to celebrate advocacywins of the past year, such as the much-needed repaving of the 15th St Cycletrack in DC, Alexandria’s decision to move forward with bike lanes on King Street, and the passage of the DC Bicycle Safety Amendment Act. And this year, BikeFest’s Biketopia theme will examine futuristic designs and encourage you to imagine what facilities could possibly exist in an ideal bike world. BikeFest is WABA’s opportunity to raise the funds needed to continue our advocacy, outreach and education efforts. Join us at BikeFest 2014 and you can help fund the expansion of trail networks, bike lanes, bikesharing and safer streets. Buy tickets here. According to the article New law aims to make bicycle riders safer, in West Virginia, motorists must now honk before passing a bicyclist. How would you like it if every motorist who passed you honked just before passing? The law also requires that bicyclists traveling "less than the normal speed of traffic...shall ride in the lane marked for bicycle use." There are many situations in which riding in a poorly designed bike lane can be dangerous. The good news is that WV now has a three-foot passing bill. Bicycling for fun and transportation is becoming more common, so a new law now requires West Virginia’s drivers to give bicycles some extra room on the roads. The Bicycle Safety Bill (HB-4304) requires bicycles to generally travel in bicycle lanes or as close as practical to the right edge of the roadway. This new law also requires drivers to give bicycle riders an audible signal when passing. Drivers must also pass on the left at a distance of not less than three feet. Local bicycle riders attending an inaugural bike run sponsored by the Bluefield, W.Va. Rotary Club welcomed the new law. Peter Romano, who organized Saturday’s event, said the law was good. More bicycle lanes would be welcome. College Avenue in Bluefield, for instance, could be wide enough for a bicycle lane, he added. Update: The existing law requires motorists to honk when passing another vehicle, but it does not appear that a bicycle is a vehicle, so it may not be the case that motorists must honk before passing a bicyclist. Here's another article on the new law in the article New W.Va. law reflects strong bicycle culture. We had a great WABA Women & Bicycles Fairfax Coffee Club at Caffe Amouri in Vienna this morning. Topics covered included: Vienna is a good place for coffee club, time is our biggest barrier to cycling for exercise (commuting by bike is justified time, biking for 'fun' feels like a guilty pleasure), going back to school, and assorted other stuff. Five of us met for about an hour and one of our members biked all the way from Del Ray on the far side of Alexandria to join us! (She wanted to get some miles in!) Two of the ladies figured out they have the same enthusiasm, interest and pace to ride road bikes together in the future. It was a super meeting. Next week's meeting will be Friday, June 13 from 7:30-8:30am. Maybe we can fill the place with women who love bikes! Update: Trail work will begin on Monday, June 30. 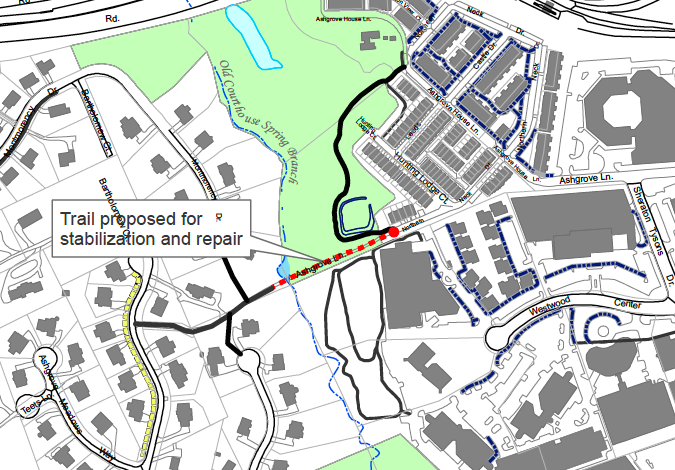 Work on repairing the Ashgrove Lane Trail in Tysons will be delayed until July 2. As we reported in May, the work was scheduled to being this week. For more information about the project see the Ashgrove Lane Trail Improvements page. We expect the page to be updated soon with the new construction date. Beginning on July 1 Virginia law requires that any driver passing a bicyclist "shall pass at a reasonable speed at least THREE feet to the left of the overtaken bicycle" according to 46.2-839 as amended. Increasing the passing distance from two feet to three feet was a major victory for bicyclists in the 2014 VA legislative session. Virginia Bicycling Federation is working with Senator Reeve's office, the Department of Motor Vehicles (DMV), State Police, the health community, local police and others on a Three Foot Passing campaign. The goal is to have a press conference on June 26. We'll post more info as it develops. It's not too early to start spreading the word. Three feet will be the MINIMUM passing distance. At higher speeds a greater passing distance is better. The new law is a great opportunity to educate motorists that bicyclists belong on the road. When we're riding in a lane that is not wide enough for us to ride safely and a motorist to pass by three feet, then they shouldn't pass. We're not required to ride on the sidewalk as many people seem to think when they shout at us from their cars. Riding on the sidewalk is usually more dangerous than riding in the road, and most sidewalks do not connect to the places we want to travel. Chairman Bulova recently convened a group of architects and designers to come up with ideas for transforming the space below the new Silver Line in Tysons, as discussed in an article in today's Post Sprucing up Silver Line concrete in Tysons is goal for brainstormers who met Wednesday. One of the suggestions is to create interesting places linked by a "pathway beneath the tracks, accessible to pedestrians or cyclists." The new elevated tracks atop massive concrete structures are a major change to the visual character of Tysons. The group discussed several ideas for softening the space such as "sustainable gardens, fiber optic light canopies and even a giant pyramid sculpture made from recycled tires towering over the tracks." The Tysons Task Force recognized the importance of making Routes 7 and 123 attractive urban boulevards rather than wide suburban arterials, places where "People will be able to walk or bike safely along Route 7 and 123 to nearby businesses." I hope that the brainstorming discussions will expand to include ways to make the full Route 7 and 123 corridors more livable, aesthetically pleasing places. The proposed pathway under the tracks is an idea discussed before by several groups. Several years ago school kids who lived west of Tysons suggested a trail in the median of Route 7 across the Dulles Toll Road leading to the Silver Line Metrorail station. The proposed trail under the tracks would be an excellent complement to the planned bike facilities and the loop trail that is contained in the draft Tysons parks plan and would provide cyclists and pedestrians another option for traveling along Route 7. Friday, June 6, 7:30 a.m.
What's better than coffee with friends before heading in to work? Meet us this week in Vienna, VA. Unless otherwise indicated, WABA Women & Bicycles events are open to those who identify as women. Women & Bicycles is WABA's outreach program designed to get more women in the D.C. area on bikes. It is based on 10 Roll Models, selected by WABA, reaching out to 10 women in their personal networks who don't bike to encourage and inspire them to ride for transportation. Women & Bicycles is generously supported by the League of American Bicycles and WABA's donors." What are the best ways to get more people to bike, walk, and take transit and instead of driving? While incentives (carrots) work, disincentives (sticks) may work better. Today's Post article "Has Dulles Toll Road outlived its value?" (print), "Higher tolls pushing many off the Dulles Toll Road" (online) looks at the effect that higher tolls are having on Toll Road user's travel patterns and attitudes. It's no surprise that most people who use the Toll Road on a regular basis are not happy to be paying higher tolls. It's also not surprising that it may be affecting their behavior. According to the article, some people contend that more commuters are using alternate routes to avoid the higher tolls. The number of trips taken on the Toll Road has decreased, but vehicle miles traveled in the US has decreased during the same time period. People interviewed in the article claim more commuters are using alternate routes such as Lawyers Road, Leesburg Pike, Route 7, and Beulah Rd. But there is no real evidence that's the case. Maybe people are just driving less. The best quote in the article is from Jessa Foor of Sterling who said rising tolls prompted her to leave her job in Arlingotn County for one in Reston, closer to home. "Most of the reason I left my job is that I was paying a ridiculous amount of money to spend two hours on the road." Maybe the "stick" of higher tolls is having an effect. Is it a bad thing that people are taking jobs closer to work? In the case of Jessa, her commute is now about 6 miles vs. approximately 25 miles (I used rough estimates based on place to place distances). A 6 mile bike commute takes about 30 minutes. This research asserts that carrots have been only modestly effective at promoting NMT [non-motorized modes] in the US, and this is in large part due to a lack of sticks to discourage alternatives to NMT, namely driving. Existing literatures provides case studies of European cities that employ a combination of carrots and sticks and also boast NMT mode shares far beyond that seen in the United States. Similar research is lacking in the US because of a lack of available sticks to study. Would using more sticks be a "war on cars?" Not necessarily. It might just be a way to take into account all of the true costs of driving, including the cost of free parking, the cost to everyone who pays what user fees don't pay for road construction and maintenance, the indirect costs of air and water pollution, etc. Maybe it's time for a few more sticks. The Air Force Association Cycling Classic in Arlington, VA takes place the weekend of June 7-8. Besides the competitive races there is a Challenge Ride, taking place on Sunday, June 8 in Crystal City. The Challenge is open to everyone. Faster riders start first on the 15K course followed by others riding at a slower pace. The Challenge Ride is an amateur, non-competitive, participatory ride, open to cyclists of all abilities. All participants will start and end in Crystal City. The ride will be held on a closed, 15km circuit in and around the Pentagon, Crystal City and the Air Force Memorial. Participants can be challenged for up to 3 hours, either as a Standard Registrant, Corporate Challenge Team or as part of Team Sabre. We will also track the performance of all those participating from our military in the Armed Forces Cycling Challenge. You do not have to start at 7:00am, as you can check in up to 8am - it just all depends on how many laps you want to complete by 10am. Organizers are looking for volunteers. Shifts run from Wednesday afternoon through Sunday afternoon.